The ONLY State-Approved Textbook for Grades K-8! Welcome to the new textbook in creative drama and theatre arts instruction for the state of Texas! Formerly known as The Drama Game File, the program features all-new content and components, with a change in delivery format from CD-ROM to online access. Drama Works! is designed to meet the new K-12 TEKS for theatre (2015) as well as teach with drama across the curriculum. It represents the cutting edge of pedagogy and technology, combining digital and print components to engage the teacher and students in hundreds of dynamic lesson plans. Adopting Drama Works! represents a substantial savings over traditional textbooks because you do not have to pay for books for every student. Pricing is per teacher and includes use by all of that teacher's students. In addition, each district-purchased license can be reassigned to a new teacher taking over for an outgoing teacher (and there is no extra charge for this transfer). *All 3 choices have 1, 2, 4, or 8 year digital access options. Save more by adopting for longer up front! Contact us to schedule a free virtual presentation with your textbook adoption committee or administration if considering licensing Drama Works! to multiple teachers. We connect with you from Los Angeles via Skype or Google Hangouts, then take you on a virtual tour of the curriculum, adoption packages, and PD teacher training options. We can answer questions and show you more than is publicly viewable on the website. 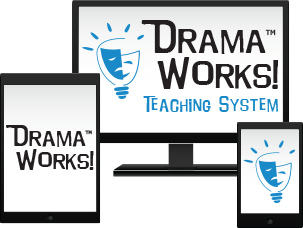 Texas schools can place orders for Drama Works! Teaching System directly in the statewide EMAT ordering system for textbooks, or send us a purchase order. School or district volume orders, textbook adoptions, and extended digital access options for Texas adoption are not available online and we do not accept credit card payments for such orders. We do accept purchase orders. We do not charge tax for orders outside of California. We do not have to be setup as a vendor for your district because Drama Works! is on the state-approved textbook list. IMA funds can be used to pay for PD services to train teachers how to use the system. Step 1: Get an official price quote from us that includes all products, licenses, shipping, and PD teacher training services. Step 2: Place your order in EMAT or send us a purchase order (PD services cannot be ordered in EMAT). Step 3: We ship you print components and you choose a Login Administrator to oversee the teacher login credentials. Step 4: We setup login credentials and send them to the Login Administrator who distributes them to each licensed teacher. Step 5: We send you the invoice for payment due and you send us the check for payment. Step 6: We work together to schedule any agreed upon teacher training services. Who do I contact in my district for help with funding? Best options are a Fine Arts or VAPA director, Curriculum & Instruction, Textbooks Coordinator, or your principal. Drama Works! 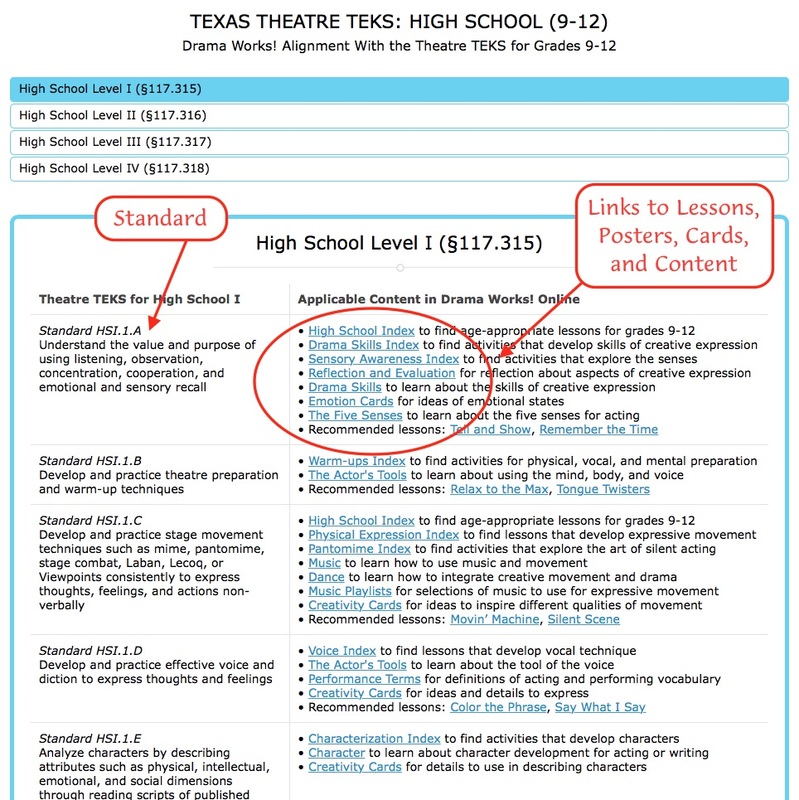 Teaching System was reviewed by the Texas State Board of Education as part of Proclamation 2015 for Fine Arts Textbooks. It was approved for adoption as the new theatre arts textbook in Texas school districts for grades K-12. Drama Works! is the ONLY state-approved theatre arts textbook for grades K-8. 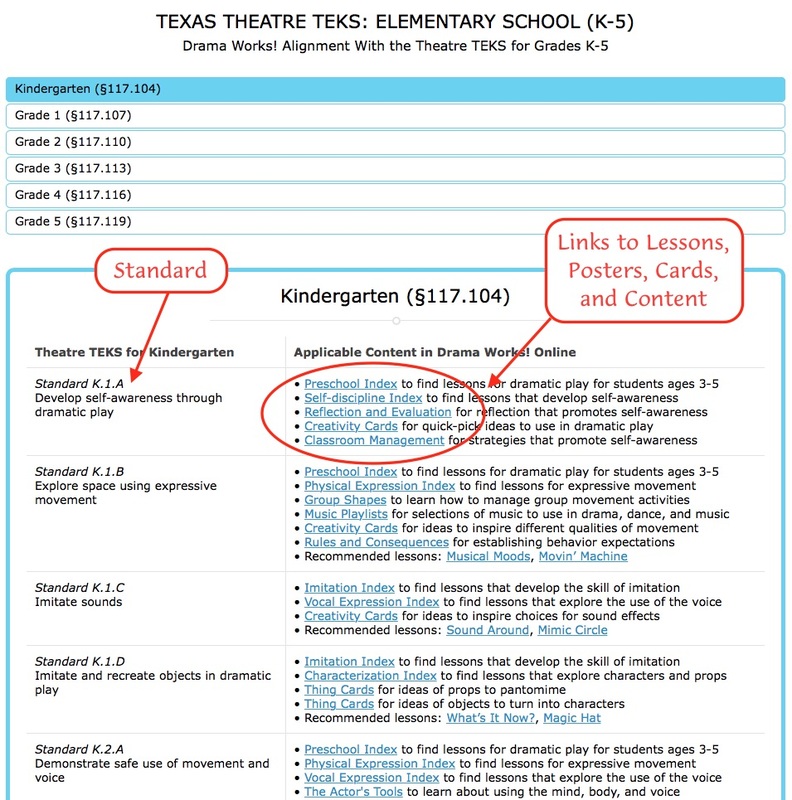 Note that the TEKS Alignment is only available in the digital component (Drama Works! Online) and not the print components (Companion Book of Lesson Plans, Creativity Cards, and Vocabulary Cards). For more details about our Texas state board review results, go to FAQ. Below are sample views of Drama Works! 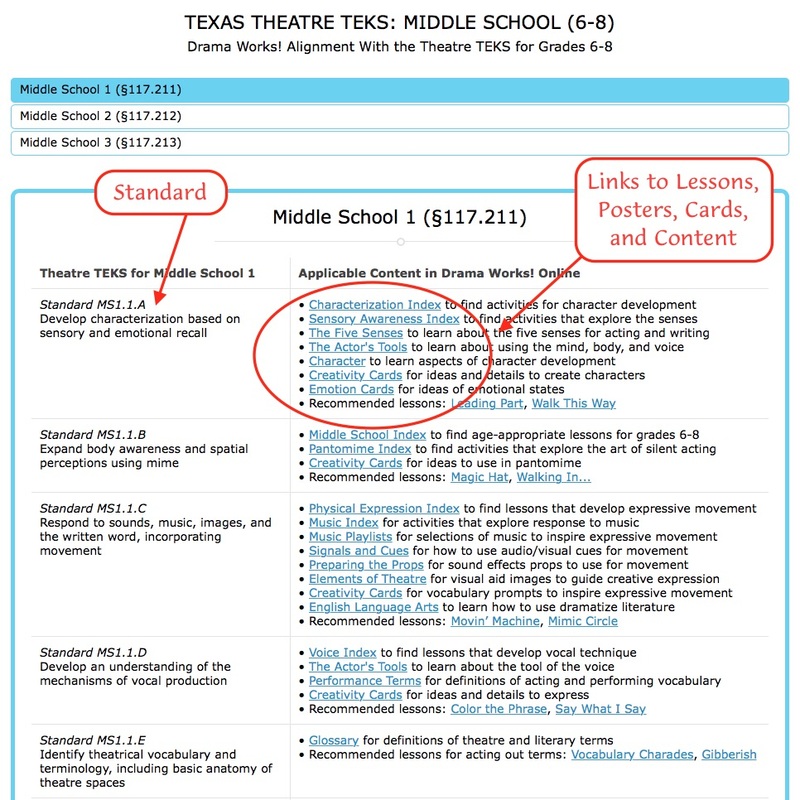 user-friendly TEKS alignment pages, which are located under Standards Alignments after logging into Drama Works! Online. The screenshot sample shows a basic view of the layout, and the complete alignment shows the full layout for all standards and grade levels (links and navigation anchors will not function in these samples, but do work for licensed users when logged in to Drama Works! Online). The passage of House Bill 5 by the Texas legislature now requires that art, music, and theatre be taught by certified teachers at the elementary level. Most districts do not employ elementary theatre teachers, or do not have enough to cover all campuses and students. However, there are other teachers that qualify to deliver the K-5 theatre TEKS. The most common solution is to equip and train elementary classroom teachers. Drama Works! was written and designed for the generalist teacher as well as the theatre specialist. We have trained thousands of elementary teachers throughout Texas and can provide the materials and training to ensure success for all teachers. Some districts have chosen to integrate the K-5 theatre TEKS into their elementary music programs. Drama Works! includes hundreds of integration ideas and activities for music instruction; it helps elementary music teachers address both music and theatre TEKS. We also have experience training groups of music teachers for arts integration. Drama Works! is the only state-approved textbook for elementary schools and it meets 100% of the K-5 theatre TEKS! Plus, you don't have to purchase books for every student, just the materials for each teacher. Our low pricing gives you the opportunity to equip and train all of your elementary teachers. With Proclamation 2015 and the IMA funds coming for fine arts, now is the time to implement quality theatre instruction for all elementary students! Contact us for a free consultation to help you design a multi-year adoption plan based on successful models we've applied in other districts. Take advantage of our Staff Development services to help teachers learn how to use Drama Works! Teaching System to meet the theatre TEKS and enhance learning across the curriculum. Learn directly from Mr. Jonas Basom, the author and creator of Drama Works! and award-winning teacher and consultant presenter. 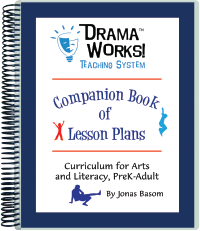 Free PD trainings are included with every 50 sets of Drama Works! purchased. See Price List for details. Contact us for a free consultation to help you design an effective staff development plan for teachers in your school/district. The following school districts have adopted Drama Works! Teaching System as their theatre arts textbook beginning in 2015. Middle school and high school adoptions are for theatre teachers. Elementary school adoptions include mostly classroom teachers or music teachers to meet the theatre TEKS through arts integration, and, in some cases, elementary theatre specialists. "The best curriculum I have seen in 35 years teaching high school drama! It is an amazing synthesis of a lifetime of top-quality theatre training, performing, teaching, and research. 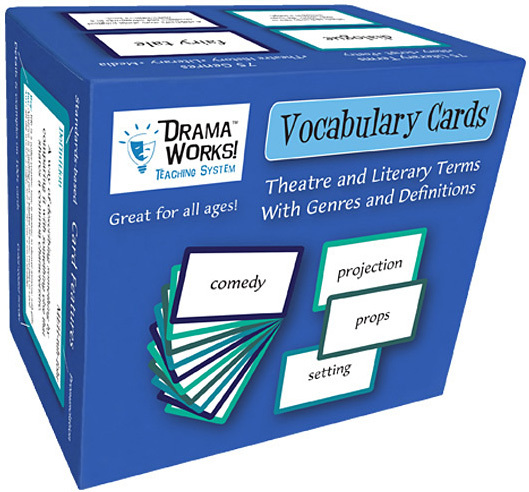 Ideal for beginning and veteran drama teachers of middle school and high school." "This outstanding program is one of the best I have seen in 30 years teaching theatre at all grade levels. The integration ideas make it easy to adapt the game to lesson plans tied to the TEKS. Non-theatre teachers can succeed with the great ideas for classroom management and coaching." "I am not at all computer literate, but this program is so easy to use. I love how each game is written so clearly with everything I need to know from set up to evaluation. Great connections to arts standards, multiple intelligences, and all school subjects." "Great for English Learners, Special Ed., and gifted students. This program improves all students' vocabulary, fluency, reading, and writing." "Great for busy teachers with little planning time. I have used the games to motivate my students to read and write, develop comprehension skills, and teach science concepts." "Empowering! I am instantly connected to a wealth of simple, creative, and effective ideas. A tremendous addition to the curriculum!" "My students gained confidence and improved their English language abilities. The games create a fun atmosphere for learning. They captivate and motivate students of all academic levels to experience success in the classroom!" "I love the refrigerator dance!" "The games and techniques on this program meet the TEKS and challenge students to the highest levels of creativity, language development, and thinking. Jonas is an engaging and inspiring presenter who has helped 120 of our generalist teachers gain skill and confidence using drama across the curriculum. These wonderful materials and dynamic teacher training workshops are perfect for meeting Senate Bill 815." "We purchased the complete kit for one elementary teacher at every grade level throughout the district. Jonas' professional development in-service trainings for our teachers received overwhelming appreciation. By the end of the day, he had changed teachers from nervous and inexperienced observers to excited and confident participants asking for more!" "We purchased the complete kit and full-day workshop for all of our theatre teachers, K-12. Our teachers absolutely loved the hands-on training!" "The best staff development we have ever had! Mr. Basom inspired 45 teachers with wonderful games that are easy to use in the classroom with different learning styles. His strategies for second language learners are some of the best I have ever seen. He is a master of his craft!" "Through his dynamic and interactive presentation, our teachers learned more effective strategies to implement the English Language Arts standards. A must see." "Jonas is a very engaging speaker. His PD training is grounded in his experience as an actor and teacher. Great strategies for managing a large group through routines and procedures. Energetic, fun, and practical!" 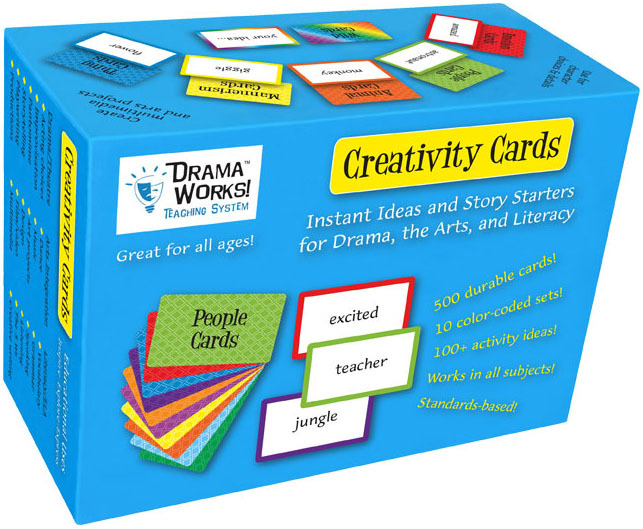 "Clearly demonstrated how we can combine the creative art of drama with an intellectually rigorous educational pedagogy that addresses language arts skills, multiple intelligences, and social skills. It was also great fun and I can apply the activities immediately to my classroom." "Educational, applicable, interesting, fun, useful, and motivating!"